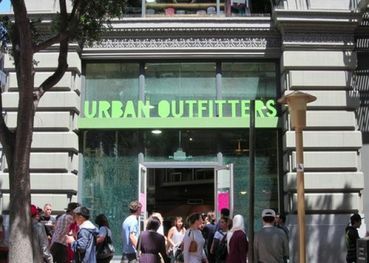 Over the last few years, Urban Outfitters has become known for three things outside of carrying overpriced clothes that fall apart the first time you wash them. Now the company is asking employees to work for free. Ah, the march toward the perfect Capitalist work force: slavery. When I read the title to this article I thought another extremist spouting half truths. I am dumbfounded! It's true! What unmitigated gall for a company to suggest salaried employees to "volunteer" their time at the fulfillment center where "you will pick, pack and ship". Their response letter to the AlterNet journalist was nothing less than a brazen, self important, idiotic response. It almost sounded like it was coming from an immature teenager. Capitalism, Republicanism to the extreme! The worst part is he seemed to be oblivious of the outrageousness of the request. Actually indignant that anyone would suggest any kind of impropriety of what he was requesting. I don't buy anything from them anyway, and now I make it a point to not to buy anything from them. Noted. Thanks, Freya. I don't shop there, and never will. Everybody should, if you have the time - and even if you think you don't have the time! - everybody should read the long line of COMMENTS after the article! Some of them are REALLY good! 'All markets should be regulated. The private sector has proven time and again that it cannot be trusted and cares only for profits. Its treasonous push to take over the government and run it as a profit center, or get rid of it entirely, is succeeding due to the apathy of uneducated workers who don't see what is happening. Tax and regulate all business and entrepreneur asshats, make sure they are not exploiting workers and evading taxation. Stop glorifying and lionizing the rich. The only people who want small gummint are the sh-theads who benefit from it, those who want to operate without scrutiny so their crimes and exploitation can go unpunished. Government is there to protect everyone, not just the rich and powerful. Government must EXPAND and become a bigger enployer to give the piggish private sector much-needed competition. This must be an international push for justice, so low-wage workers overseas are unionized and taught to fight for their rights. The rich don't give a crap about nations or patriotism...patriotism is just a card they play to get dopes to elect their toadies. REVOLUTION!!!!!!!!!!!! These companies are getting braver, they don't even try to steal from their employees they want the employees to willingly work for free. They can by pass the lawsuits as this is voluntary, Hahahahaha, yeah right. These people need to be put OUT of business just like the ones below who were caught STEALING from people many already working for minimum wages. As I said, LOTSOF Good Comments to that article. Those folks making Comments were right on the mark.....! Well gee whiz! It was good of them to provide lunch. I wonder how the Baloney sandwiches were.